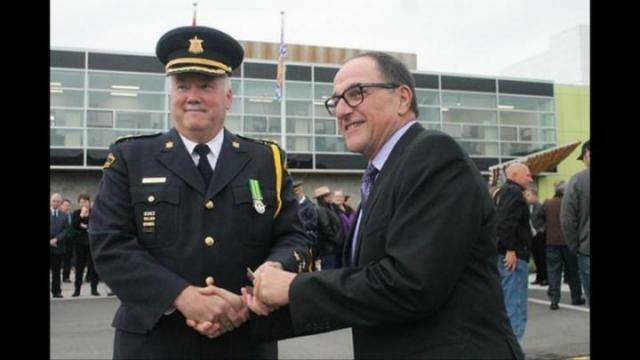 Warden Steve DiCastri recieves the keys to the Okanagan Correctional Centre from CEO of Plenary Concessions Mike Marasco on Oct. 21. The largest correctional centre in B.C. had its official grand opening in prior to tours for the public. The largest correctional centre in B.C., and the first in Canada built through a public-private partnership on First Nation’s land, is officially open for business. The $200-million facility had its grand opening at the Senkulmen Business Park just north of Oliver on Oct. 21 where the ownership was handed over to the province. The province officially took possession on Oct. 21 after construction finished in September. Baptiste spoke on behalf of Osoyoos Indian Band Cheif Clarence Louie, who was not able to attend the grand opening. The facility is responsible for adding 300 direct jobs in the South Okanagan for correctional officers and support staff, with only 12 more positions to be filled. The OCC is the first correctional facility to open in the province in 15 years, and the public’s interest has been peaked, with an estimated 3,000 signing up for tours to a get a rare glimpse inside the facility. “There were a number of communities that were interested in bringing this new centre home and it’s testament to the local leadership of the Osoyoos Indian Band and the Town of Oliver that this centre happened to be built here,” Mike Morris, Solicitor General and Minister of Public Safety said. Around 140 inmates begin phasing into the facility on Jan. 15, with another phase of inmates expected in May. “Not only are they new, long-term employees, they are now your new neighbours and they are very likely to be your new friends,” Hovanes said. Media were granted a sneak peak inside the brand new facility which contains a full body scanner, similar to those in airports, which is intended to fight the entry of contraband into the facility. Cells are currently planned to be filled with one inmate per cell, easing the load for all current BC Corrections facilities, currently sitting at 135 per cent capacity — meaning 35 per cent of cells in B.C. have two inmates. Each non-segregated cell is equipped with a TV paid for by the inmate benefit fund and can house two inmates. The agreement for the OCC includes a 60-year land lease with a 20-year renewal option. The 29,500-square-metre, high-security facility will house both male and female, remanded and sentenced inmates, with one of its 11 living units exclusively for women. The maximum sentence to be served at the OCC is two years less a day. The centre accounts for about half of the nearly 800 cells added throughout the province since 2008 — an expansion that has more than doubled inmate capacity in B.C.’s interior, which is also home to regional correctional centres in Prince George and Kamloops.